The one authority that the U.S. Senate has over ratification of treaties was obviated even under Senate Democratic rule by the required two-thirds rule. This effectively blocked such key treaties as the Comprehensive Test Ban Treaty (CTBT) and the Law of the Sea Treaty. The president can clearly sign executive agreements with foreign governments which, while not binding on future administrations, can achieve certain key objectives. He has already bypassed Congress on climate change by putting in place through executive actions restrictions on climate change related greenhouse gasses. This includes better fuel economy in cars and limiting coal emissions at home. Just recently Obama obtained arranged a historic agreement with Chinese President Xi Jinping to place joint limits on greenhouse gasses. This is an important initiative since these two countries are the largest emitters of such gasses. The agreement paves the way for other countries to cut their emissions and to help make progress at a key international climate meeting next year. Among the key elements of the agreement is that the United States will double the rate at which it reduces dangerous carbon pollution from fossil fuels. On the other side, China announced that they will halt the growth of emissions by 2030 — the first time a date has ever been set — and commit to get 20 percent of their energy from clean sources. Other issues were also addressed and some progress was made on military-to-military issues, communications, and on visa questions. Both leaders signaled that further cooperation is possible, but rough waters still lie ahead. 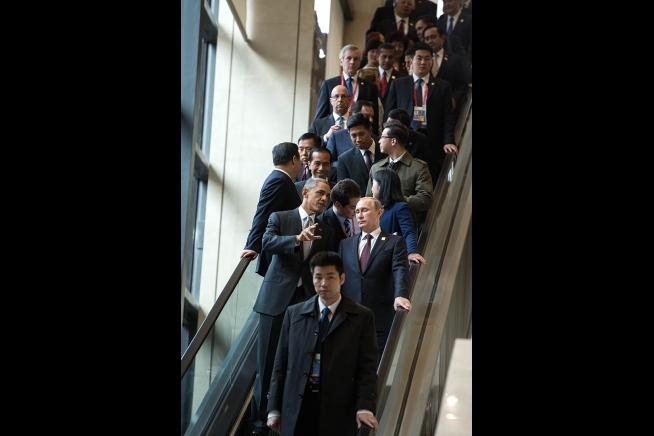 At the G-20 meeting President Obama took a very active stance on issues like trade, climate change, and Ukraine. On the thorny Iranian nuclear deal, Secretary John Kerry was sent to the negotiations for what will be the final round of this segment of very hard differences between the two sides. Vice President Biden went to the Middle East and North Africa to deal with difficult and conflicting issues with several key countries. President Obama has also continued to make clear that he will act under his presidential authority to make changes in our immigration priorities, practices, and policies. The key question is whether the corrosiveness of our last election and the relentless hate and lies of much of our political fights, as well as billionaire money pouring into attack ads, will make any rational dialogue even possible. What we may be seeing is a post election “full court press” by the Obama administration to move strongly on a broad range of issues related to Iran, ISIS (including Syria, Iraq, and the Middle East), dealing with a resurgent Russia, and also to strengthen his “pivot to Asia.” And not least as he and Treasury Secretary Jack Lew did to urge an global impetus towards a growth strategy rather than a mindless “austerity” approach favored by Germany and the right-wing Tory government in Britain, which has resulted in signs of a disastrous downturn in economic growth in many key countries and regions. In the face of these challenges one would think a return to bipartisan cooperation might be in order. But there remains little sign of such wisdom. In fact we may even see a heightened level of obstruction by the GOP as they are lining up a series of bills and committee hearings with no purpose to solve problems, but rather to steer up more obstacles to Obama’s effort to make our world more safe and prosperous. Already the Republican know-nothings of the dirty energy sector have cried out in opposition, showing again their indifference to the global existential crisis that is set to make our frail planet a more dangerous place for all of humanity and nature. This was a great coup for the Obama administration and even more so as it was a very difficult achievement given the state of our relations with China on other issues. Another issue which will be on the agenda of Congress, and inevitably an immediate issue for President Obama, is dealing with Syria, Iraq, and most urgently actions to degrade and possibly “defeat” ISIS (Islamic State/ISIL). There is the question of Congressional authorization for the conflict and funding which will test the search for a “bipartisan” approach. Not least is the still complex and muddy issue of how to deal with the Assad regime which continues its own killing spree of innocent civilians. My analysis is that this effort to both help bring a measure of security and broad governmental reform and inclusiveness will invariably be a “long game” rather than a short one, but keeping the U.S. out of an active combat role is the right decision as is trying to help the countries of the region to seek and find a measure of cooperation, tolerance, and responsible governance. But it seems we are about to again reexamine our basic strategy in the region in light of new developments. But military leaders have indicated we are turning the tide with our current strategy and actions. The president as we noted also has before him the “end game” of the Iran negotiations aimed at preventing that regime from developing nuclear weapons. This has been a most difficult effort but one that is critical to undertake in order to prevent a future war should Iran try to develop such weapons. Both sides have strong incentives to find a mutually agreeable solution. The goal is to finalize an agreement before the end of November. Most acknowledge that a final agreement is unlikely to be completed in this time frame but it is possible that some of partial agreement might be announced by the deadline and further work would be needed to complete all the complicated issues that are still outstanding. The problem is that many Republicans are urging turning our back on the Iranian diplomatic effort and to initiate added sanctions and to consider military tools which would largely add to the instability of the region and ignite the kind of conflict that would not be in America’s interest or that of any country in the region. While there are a number of actions the administration can take to reduce some sanctions, it will take Congress to lift them and again it will test whether the GOP will act in the interest of regional security and peace or again be the “war” faction that sees only costly and never ending destructive war as an answer to every problem. What is also clear after the midterm election is the absence of any real debate on foreign policy and national security. The Republicans, given this vacuous debate, have no legitimate mandate for a “war oriented” push and a large escalation of military spending on largely useless weapon systems that are of little use in the conflicts we are likely to see in the future. But we are likely to see more money towards defense. Nor have the media acquitted themselves to better inform our citizens and provide a fair forum for a constructive debate on America’s role in the world. The outlook that this will be realized seems very dim at the moment. My bet is that over the next two short years we will see more and more international issues and severe challenges abroad which will soon become a focus for some debate among the likely presidential candidates, as well as some congressional types that will face their own elections. The question we need to consider is whether our nation will get the quality political dialogue it deserves, given its importance, or the same drivel we have gotten from some of our clueless and highly partisan leaders and from much the so called mainline popular press. Expect more on these issues in the coming weeks. Be sure to follow our “Road to 2016” quotes section for insights on how shallow or how deep the debate on national security and foreign affairs is among the American leadership and 2016 presidential contenders. We welcome your comments! Sign up for regular messages on new posts!